The goal of Residence Life is to foster a residence hall environment where students experience caring relationships with people serving one another and encouraging each other to seek Christ and make connections between their faith and their everyday life. When students leave Moody, our hope is that they will apply what they have experienced in the residence halls and authentically model a life of faithfully following Jesus Christ. We hope they will intentionally foster caring relationships which reflect Christ's love for all people, be willing to speak words of encouragement and respond lovingly to breakdowns in integrity. A Resident Assistant is assigned to each floor to provide leadership and build community. Every RA oversees a leadership team comprised of students who have a heart for ministry on the floor. The Leadership Team assists the RA in providing support and care to students, facilitating activities, and carrying out other administrative duties. Bro-Sis (Brother-Sister) exists to foster community between men and women. Each men's floor is paired with a women's floor, providing students with opportunities for forming friendships. Bro-Sis RA's work together to plan worship nights, outings in the city, etc. Bro-Sis tables are also designated in the SDR so that you can break bread and fellowship together. While the classroom provides an excellent space for academic learning, Moody's residential community provides a unique environment for learning that is relational, transformational, and holistic. In recognition of this, Campus Ministries works alongside Residence Life to provide intentional opportunities for students to walk alongside their peers as they seek to become more rooted in their relationship with Christ and grow in self-awareness, vulnerability, accountability, and prayer. Campus Ministries intersects with Residence Life on the ground level through floor-based, community-focused, Christ-centered small groups known as Life Groups. 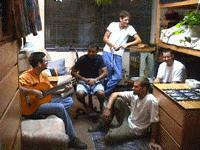 Life Groups provide a holistic Spiritual Formation approach to a student's residential experience. Every floor will have a Life Group Leader who will be a part of the floor's Lead Team and will work closely with the RA or GRA to foster and build life-giving, Christ-centered community on the floor or hall. Through Life Groups, we hope that students will learn what it means to live life in community and put our learning into practice. Moody Bible Institute has five housing facilities to accommodate its on-campus students. Culbertson provides accommodations for Undergraduate male students. Houghton and Smith halls provide accommodations for Undergraduate female students. Dryer hall provides accomodations for Undergraduate male & female students on separate floors. Jenkins Hall provides accommodations for Seminary students and married students. Some Undergraduate students who meet certain qualifications also live in Jenkins. The residence hall community is designed to provide the student with meaningful relationships that will shape his or her character. Because of Moody’s commitment to community and mentoring, we have chosen to maintain a mix of majors, ages, and classes on each floor. We accomplish this by reserving approximately 25 percent of the rooms on each floor for new students. Culbertson Hall houses male students in a 19-story building with three elevators and a large laundry facility in the basement. The second floor of Culby is home to Moody Central, a solutions-based service center for students. Moody Central includes the following departments: Academic Records, Career Development Center, Financial Aid, International Students Office, PCM/Field Education, Residence Life, Student Accounts and Student Development. Floors 3–19 each house approximately 30 students and one Resident Assistant per floor in double occupancy rooms. Moody provides a twin bed, desk, chair and dresser for each student. Each floor has a lounge with a kitchenette, large community bathroom, and a community storage room. Culbertson Hall is air conditioned in the summer. A male Residence Supervisor lives in an apartment on the 18th floor. Dryer Hall houses 98 male students and 49 female students in a four-story building with two elevators and a laundry facility on the ground floor. The ground floor has a seating area with a television and a 24-hour computer lab with a printer. Floors one through three house students in triple occupancy rooms. Each floor has a lounge with a kitchenette and storage room. Every room has a sink and toilet with each floor having a common shower area. A Resident Assistant lives on each floor. Moody provides a desk, desk chair, twin bed, small closet and dresser for each student. All rooms are air conditioned. Floors 3–10 have north and west wings with two Resident Assistants per floor. Both wings share a common lounge, kitchen, bathroom and basement storage area. Moody provides for each resident student a twin bed, desk, desk chair, closet and dresser. There are double and single occupancy rooms on each floor. Every room has closet space and a sink and mirror. Each wing houses approximately 30 students. Each room has a student-controlled heating and air conditioning unit. Jenkins Hall is a 14-story apartment building that houses married students, seminary students, and some undergraduate students as well as senior citizens. Undergraduate students are chosen to live in Jenkins Hall through an application process that considers credit hours, references and leadership experience. The ground floor features a reading room, a lounge with a TV, a game room and a meeting room. Floors two through fourteen contain 17 apartments each. The apartments contain a bedroom, bathroom, kitchen, living room and storage closet. All utilities are included in the housing cost. All apartments are furnished with a refrigerator, stove, campus phone and access to the Internet. The building also features laundry facilities. Single Undergraduate apartments are triple occupancy. To learn more about living in Jenkins, review the Jenkins Living Guide. Smith Hall houses female students in an eight-story building with one elevator. Floors one through three contain offices for Counseling Services, Moody Standard Newspaper, Health Service, Events and Guest Services and Admissions. Floors 4–5 house approximately 35 students with one Resident Assistant per floor. These floors each have a lounge, kitchen, laundry room and storage room. Rooms are double occupancy with private bathrooms. Moody provides for each resident student a twin bed, desk, chair and dresser.